StayLinked CTO, Justin Griffith will be attending the Momentum event, and is excited to guide attendees through some of the exciting new features. 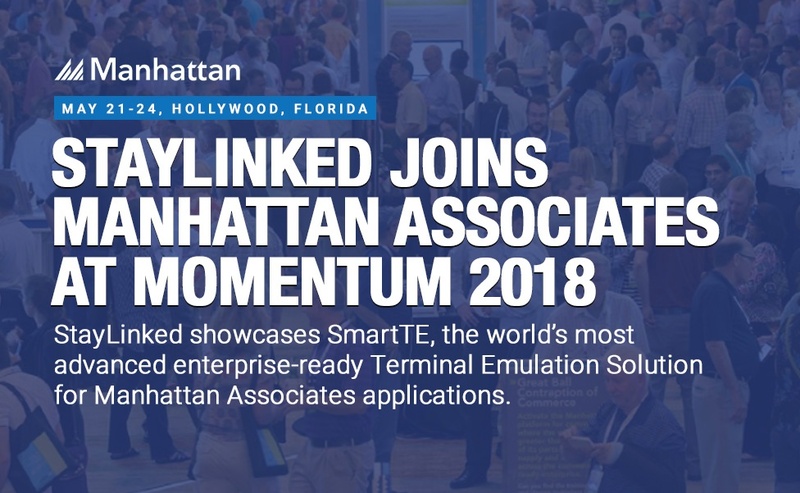 "SmartTE v14.4 increases the available options and ease-of-use of graphical elements making modernization easier and faster than ever," says Griffith. "And the Automation API delivers capabilities never before available in a Terminal Emulation product." Custom, graphical on-screen buttons for various tasks, independent of the emulation screen. Create and maintain custom keyboards, custom toolbars or any collection of buttons. As an innovative business intelligence tool designed with Terminal Emulation in mind, StayLinked iQ allows customers to accurately measure the productivity of warehouse operations by collecting, analyzing, and presenting device and worker information through an intuitive, browser-based console: Customers can see at a glance (and in-depth) how productive the warehouse is. It also enables you to diagnose and troubleshoot any inefficiencies due to worker inactivity, network outages, or a number of other issues you may not have known existed. One of the compelling features emerging in StayLinked iQ is the worker productivity leaderboard, an easy-to-read list of workers who are the most productive as well as a list of workers who are experiencing the most issues on the floor. Customers can then use StayLinked iQ to diagnose and remedy issues of worker inactivity or inefficiency that may not even be the fault of the workers themselves, such as enormous travel distances between products in an order, or poor network coverage because of the remote location of a particular access point. StayLinked iQ also allows you to see which devices are performing better than others. If you have a mix of hardware models in production, customers can use StayLinked iQ to see how each model stacks up against the others. And if one or more devices happen to be giving your workers trouble, StayLinked iQ will help identify the problem devices so you can initiate troubleshooting.